In Breaks in the Chain, Paul Apostolidis investigates the personal life stories of a group of Mexican immigrant meatpackers who are at once typical and extraordinary. After crossing the border clandestinely and navigating the treacherous world of the undocumented, they waged a campaign to democratize their union and their workplace in the most hazardous industry in the United States. Linking stories of immigration to stories about working on the meat production line—the chain—he reveals the surprising power of activism by immigrant workers and their allies and demonstrates how it can—and should—promote social and political democracy in America. Here, Apostolidis discusses Wisconsin workers' recent and continuing plight with regard to his research. Citizens rally in Washington, DC, recently for Wisconsin union workers. Paul Apostolidis discusses how employer prerogatives that are often difficult to challenge lie at the heart of the U.S.'s wage-based labor system. Image source. Wisconsin’s infamous Act 10 is snarled in the courts and the media spotlight on Governor Walker’s assault on workers’ rights has dimmed. 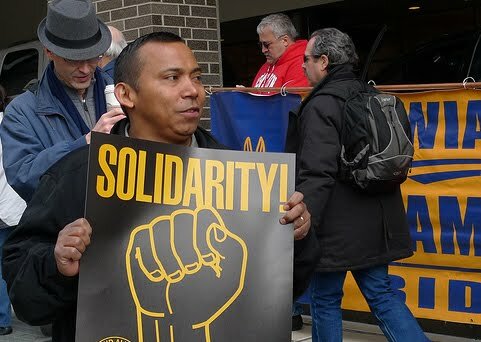 But after spending the last decade writing about a courageous bunch of workers in Washington State who came to realize, as the song goes, that “there is power in a union,” and who fought a long and bitter struggle to preserve that power, I hope Americans of good will do what takes to keep our “Wisconsin moment” alive. Events in Wisconsin parallel the labor upsurge I wrote about in Breaks in the Chain in key ways, even though some things are very different. What caught my eye right from the start was the specific focus of the Wisconsin Republicans’ attack on unions: the nullification of employees’ rights to bargain collectively about anything other than wages, above all their working conditions. The media’s analysis of this vital issue has been scanty, to say the least. Maybe that’s because when workers assert a right to determine the qualitative features of labor processes – not just their quantitative rewards – they challenge employer prerogatives that lie at the very heart of our wage-based labor system. They propose, in effect, that employers share with them the power to design socioeconomic processes. They strive to exert their own creative, innovative capacities instead of haggling over a payoff for letting those abilities atrophy from disuse. Managers, public sector or private, would much rather have it the latter way, as my research notes, at the Tyson beef plant (Chapter 4) and, more recently, in the land of cheese. As Breaks in the Chain shows, the physical and psychological horrors of work in the slaughterhouse are extreme. When the Tyson workers fought to change working conditions at the plant, they sought freedom from gravely disabling occupational safety and health hazards and the transformation of a shop floor culture so abusive that workers invoked religious metaphor to describe it, comparing it to “Calvary” and to “hell.” I’ve seen no reports that Wisconsin public workers face working conditions so outrageously unjust. But it’s precisely because the general assumption increasingly exists that workers have no rightful place in determining the conditions of their own labor that, back in 2004, Tyson could summarily reject its employees’ bid for a voice in setting line speeds and refuse to negotiate over anything other than wages and benefits. The showdown in Wisconsin shows just how broad and deep this contemptuous attitude toward working people has become, and how urgent the fight against it remains. Find out more about Paul Apostolidis' research in Breaks in the Chain: What Immigrant Workers Can Teach American about Democracy. "Theoretically illuminating, politically engaged, and of vital importance, Breaks in the Chain lucidly intertwines subtle reflections about the ways immigrants negotiate and contest power with the interview narratives in a riveting manner. It exemplifies the very best of contemporary political theory."